Gum Disease illustrates how local infections may have systemic consequences. Infection and inflammation in the mouth have been linked to a variety of systemic conditions, including pregnancy complications, type 2 diabetes, heart disease and stroke. Recent national media coverage spotlighting inflammation has spawned much interest in this topic. If infection in the gums not only precedes inflammation in the arteries, but encourages it. Inflammatory molecules produced locally in tissue (like the gums) can get into the bloodstream and travel throughout the body. The inflammation-causing bacteria can also infect blood and travel to distant points, such as the heart. Article by Philip E. Ross, Scientific American “Oral and Whole Body Health”, pages 6-11. 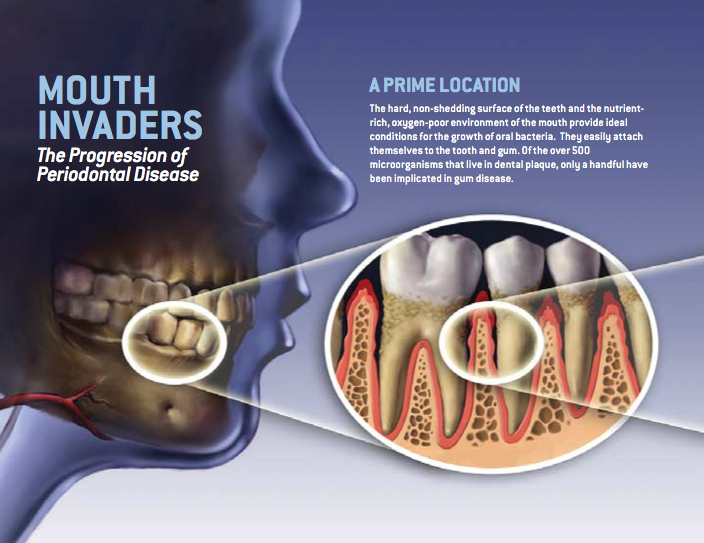 Only a handful of the more than 500 species of bacteria that live in the mouth are implicated in gum disease. They are particularly hard to eradicate because they form biofilms: tough, many layered, mineral encrusted communities. Huddling in the deepest layers are the oxygen shunning, or anaerobic, bacteria that appear to cause the most damage. When bacteria come in contact with gums, they secrete toxins that break down gum lining, creating a tiny ulcer. The body’s bloodhounds, the neutrophil cells, then attack these invaders. If they keep the biofi lm at bay, the battlereaches a standoff, termed gingivitis. If, however, the bacteria continue to advance into the gums, the immune system signals a higher state of alert, mobilizing macrophages (Greek for “big eaters”). These white blood cells swallow bacteria, along with the gorged, dead and dying neutrophils, and any cellular detritus that may litter the battlefield. Meanwhile, the macrophages secrete fatty acids and interleukin-1 (IL-1), a primary regulator of inflammatory and immune responses, as well as tumor necrosis factor alpha (TNF), a protein that heightens inflammation. The resulting mayhem may be likened to urban warfare, with immune soldiers running from house to house,tossing in grenades, spraying rooms with machine-gun fi re, all before asking who is friend and who is foe. No wonder the tissue breaks down. The ulcers sink deeper into the gum, creating a “periodontal pocket”; full-blown periodontitis begins. If the disease is allowed to progress, the advancing infl ammation eats away the ligaments that anchor teeth in their sockets, loosening them until they at last fall out. Nowadays this happens less frequently; the patient notices the bleeding and goes to a dentist. The dentist or dental hygienist scrapes away inflammation riddled material and treats the infection with antibiotics. Treatment, however, cannot prevent the influx of bacteria. The disease will recur if the patient does not stick to a rigorous routine of brushing, flossing, rinsing and dental cleanings. And although the damage in periodontal disease is primarily the result of the inflammatory process, it can only be prevented or treated by addressing the bacterial biofilm that is infecting the gums. What is worse, the chance of early detection is lessened in those who are most vulnerable—smokers. Just as tobacco smoke irritates the gums, heightening inflammation, it also tends to mask telltale bleeding. The hard, non-shedding surface of the teeth and the nutrient rich, oxygen-poor environment of the mouth provide ideal conditions for the growth of oral bacteria. They easily attach themselves to the tooth and gum. Of the over 500 microorganisms that live in dental plaque, only a handful have been implicated in gum disease. If infection in the gums not only precedes inflammation in the arteries, but encourages it, the question is how does it happen?